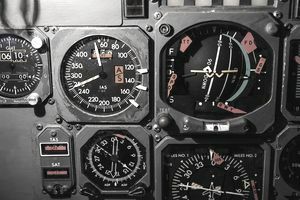 Aircraft altimeters tell pilots how high they're flying, and understanding how they work is necessary for safe flight. It's a simple and basic flight instrument, yet it can be misinterpreted by pilots—sometimes with grave consequences. Altimeters range from conventional to newer computerized systems found on technologically advanced aircraft. Newer altimeters use high-tech sensors to detect altitude. Altitude also can be accurately attained with an instrument flight rules (IFR)-certified GPS system on board. Conventional aircraft altimeters work by measuring the atmospheric pressure at the airplane's flight altitude and comparing it to a preset pressure value. Air pressure decreases by about one-inch mercury for each 1,000-foot altitude increase. Inside the instrument, the casing is a set of three aneroid wafers that are sealed but still able to expand and contract. These aneroid wafers are calibrated to sea level pressure of 29.92" mercury inside. An outside static pressure lower than 29.92" Hg (as experienced with a gain in altitude) causes the wafers to expand since the pressure inside of the sealed wafers is greater than on the outside. A higher static pressure causes the wafers to compress. When the static pressure increases or decreases, mechanical connections trigger the altimeter needle to show a corresponding altitude in feet. The appearance of altimeters varies, but a common one is known as a three-point altimeter. This type of altimeter has a background similar to a clock with numbers from zero to 9 and three needles on the face. One is a short, wide needle that shows height in 10,000-foot increments, one is a slightly longer and wider needle that depicts height in 1,000-foot increments, and the longest needle shows height in 100-foot increments. Older altimeters have only one needle that circles once around the dial for every 1,000 feet in altitude. Most altimeters in use today include a Kollsman window, which is an adjustable dial that allows the pilot to enter the local pressure values for his flight. Entering a pressure value in the Kollsman window adjusts the altitude for nonstandard pressure and gives a more accurate altitude. Indicated Altitude: The altitude depicted on the altimeter when the pressure is set correctly in the Kollsman window. Pressure Altitude: The altitude shown on the altimeter when the standard atmosphere level of 29.92" Hg is entered in the Kollsman window, or the height above the standard datum plane. Pressure altitude is used often in flight planning calculations. Density Altitude: Pressure altitude adjusted for nonstandard temperature. Density often is described as how high the aircraft feels like it is since density altitude affects aircraft performance. Position: The position of static ports lends itself to disrupted airflow during certain maneuvers, phases of flight, and wind conditions. Disturbed airflow over the static port can cause erroneous readings on the altimeter. Elasticity: Over time, the expansion and contraction of aneroid wafers in the altimeter can cause metal fatigue. Sometimes known as hysteresis, these changes in the elasticity of the instrument can cause inaccuracies. Pilot: Pilots must establish the correct altimeter setting and enter it correctly into the Kollsman window in order for the altimeter to read correctly. Failure to set the altimeter correctly can cause altitude errors of hundreds of feet. A difference of 1" Hg can cause an altitude deviation of 1,000 feet. Density: The density of the air changes from one area to the next, especially with temperature changes. Density errors associated with altimeters are apparent on longer flights, but also can happen on short flights that involve significant temperature changes. A pilot will stay at the same height above the ground (as indicated on the altimeter) only if the temperature and pressure both remain the same. Flying from a high-pressure area to a low-pressure area without changing the altimeter would result in the aircraft being lower than expected. And because density changes with temperature, flying from a hot area to a cold area without changing the altimeter setting also will result in the aircraft flying a lower true altitude than expected. Static Port Blockage: Blockage of the static port would result in static pressure being trapped inside of the instrument casing (but outside of the aneroid wafers), and the altimeter would freeze in place at the altitude it depicted at the time of the blockage. Since no air pressure changes would be measured, the altimeter needles would not move until the blockage was fixed.